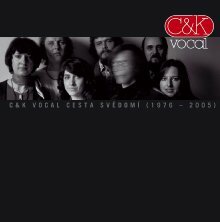 In its 1970s and 1980s heyday, the rock band C & K Vocal was a true phenomenon that served to help its members to produce exceptional solo projects (Helena Arnetová’s albums) or as a springboard for an individual career (Luboš Pospíšil). Their music enthused rock, jazz and folk musicians alike. The retrospective under the original title of the suite Cesta svědomí (Path of Conscience), which the Communist “word guardians” renamed Path of Light, contains twentysix recordings drawn from the albums Generace (Generation) and Causa krysař (The Rat-catcher Case), half of which are being released on CD for the very first time. Especially noteworthy are the four recordings from the unreleased album A co básník (And what about the Poet), whose fragment served as the basis for the next album Balada o Zemi (Ballad of the Earth), and the brand-new recording of Vteřiny (Seconds) in an a cappella version. In addition to plenty of photographs, the booklet is accompanied by František Horáček’s period sleevenotes, with a new postscript penned by Ladislav Kantor. The engrossing sleeve is the work of Karel Haloun. During the Seventies C & K Vocal played beautiful progressive rock for several female and male voices. The first CD starts with six of the seven songs of their debut album Generace, recorded 1974-1976 and released in 1976 with English vocals and in 1977 with Czech vocals. It continues with material recorded in the early Eighties, partly from their third album Balada o Zemi, just in the same sound. The second CD contains the same music in a more modern sound including parts from their forth and last LP Causa krysař (recorded 1989) combined with songs from singles and unreleased material. The voices of C & K Vocal can be found also on several recordings of other Czechoslovakian bands.